​All Farsoon systems come standard with a full software package which enables the user to make full use of their additive manufacturing system. Farsoon’s software package includes the versatile build preparation software BuildstarTM and the powerful open platform machine control softwareMakestarTM.The BuildstarTM and MakestarTM software packages combine capabilities that enable to user to manage their digital file from build preparation and parameter setup all the way to machine control and in build monitoring all in a user experience that is accessible and intuitive. In addition Farsoon software is fully compatible with third party build preparation software providing the user with maximum flexibility. Farsoon software is fully compatible with the industry standard STL file format. Simply select any STL file to be imported into Buildstar™. Once imported the files can be moved, rotated and scaled as necessary to create a compact build file which fits the build platform of selected Farsoon system. Buildstar™ for Farsoon metal systems comes with built in ability for support creation for your metal part. The support module allows for the manual design as well automatic generation of a variety of support designs including vertebral supports, cross supports, grid supports. By providing in house support generation capability Farsoon Technology enhances the ability to provide the user with full spectrum support for their metal additive manufacturing needs. Once a 3d file has been imported into Farsoon’s Buildstar™ software the user is able to modify and manipulate the file as needed to create the optimal build packet. Buildstar™ provides the user with many essential tools such as rotate, scale, array etc. Once the build packet is assembled Buildstar™ is able to verify the builds production readiness through several functions including automatic collision detection, dimensional compensation, as well as generating reports which inform the user of the estimated build time and powder requirements. Farsoon’s Buildstar™ software offers a variety tools to optimize the sintering process. Scan and slice preview capability enables to software to predict areas of risk as well as suggest methods of improving quality and yield of parts as well as providing accurate estimations on scan time and material requirements. In addition Buildstar™ comes standard with a variety of scan strategies for the user to ensure optimized efficiency and enhanced part quality. The Makestar™ software is a powerful control and operating system for Farsoon’s metal and plastic systems. Makestar™ imports the build file prepared in Farsoon’s Buildstar™ software, or a third party build setup software, and acts as the interface in which the user can assign Farsoon’s systems to begin processing of the build file. This software package is fully open and features many functions and modules to help enhance the build process. The Makestar™ is a fully open software package. This means that the user is capable of editing key parameters to create the most optimized process for their individual needs. Over 100 parameters are open to the user to adjust including laser and scanner parameters, powder parameters, heating parameters and many others. Makestar™ features both an advanced and production interface. The advanced interface allows full access to all parameters and controls of the systems and is perfectly suited for the experienced user. The production interface features a streamlined and intuitive touch interface for easy every day operation of the machine in a production environment. The latest Makestar™ software features real-time remote monitoring capability allowing the user to remotely view the build chamber as well as monitoring key operation status including temperature, oxygen content, piston position, print height and other data and equipment operating status. Farsoon’s Makestar™ software features slice on the fly capability. This features enables the software to process the slicing operation as the machine operates allowing for “online” addition and removal of parts to the build file as it is being processed in the system. 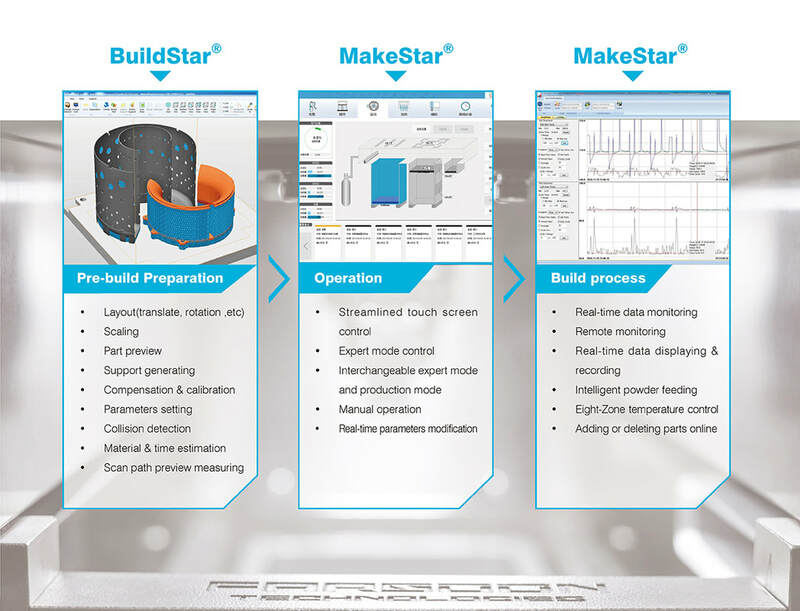 Makestar™ features the capability to analyze the build file and predict the optimum amount of powder required per build. This can then be translated into an optimized amount of powder added per layer resulting in overall reduced powder usage.